Uses the image resolution trigger values and prints on each page of a PDF file the lowest resolution that is used by an image on that page. Uses the smallest distance between a text object and the TrimBox to define the width for mirroring page content. That makes sure that text objects do not show up in the bleed. It does this in a loop until there is no text closer than 3 mm to the mirrored page content. The download contains kfpx Process Plans for the two examples as well as a simple demo file that can be used to try them out. This Process Plan runs in a loop. 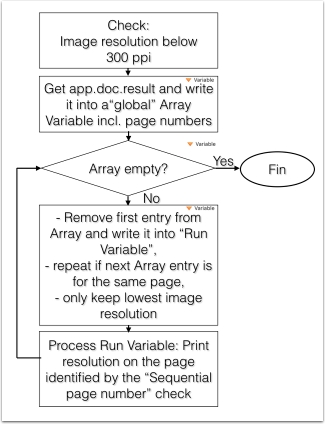 The flow chart below gives an overview about how processing takes place in the 5 steps of the Process Plan and how that makes sure that each page is processed separately. This is done to "remember" the TrimBox since that has to be modified during processing. Finds all text objects that are so close to TrimBox that they would be mirrored by a bleed generation fixup. The width of bleed is defined by using a Script Variable "width_of_bleed". That first copies app.doc.result.checks.hits into a local Variable. It then generates an array variable "loc_triggerarray" into which all trigger values are written. Finally Math.min.apply is used to determine what is the smallest distance. Then the TrimBox is set to the new CropBox because that makes it easier to find out whether we already have generated enough bleed. After that processing goes back to the Check in step 2. If by then there is no text that is close to the (new) TrimBox (that at the same time is the CropBox) processing goes forth to step 5, otherwise the procedure above is repeated. Processing get to here only if there is no text closer than 3 mm to TrimBox. It sets the TrimBox back to the ArtBox which was the original TrimBox of the file after step 1. Finally the ArtBox that was only used temporarily has to be removed.